Research in string theory over the last several decades has yielded a rich interaction with algebraic geometry. In 1985, the introduction of Calabi-Yau manifolds into physics as a way to compactify ten-dimensional space-time has led to exciting cross-fertilization between physics and mathematics, especially with the discovery of mirror symmetry in 1989. A new string revolution in the mid-1990s brought the notion of branes to the forefront. As foreseen by Kontsevich, these turned out to have mathematical counterparts in the derived category of coherent sheaves on an algebraic variety and the Fukaya category of a symplectic manifold. This has led to exciting new work, including the Strominger-Yau-Zaslow conjecture, which used the theory of branes to propose a geometric basis for mirror symmetry, the theory of stability conditions on triangulated categories, and a physical basis for the McKay correspondence. These developments have led to a great deal of new mathematical work. One difficulty in understanding all aspects of this work is that it requires being able to speak two different languages, the language of string theory and the language of algebraic geometry. The 2002 Clay School on Geometry and String Theory set out to bridge this gap, and this monograph builds on the expository lectures given there to provide an up-to-date discussion including subsequent developments. A natural sequel to the first Clay monograph on Mirror Symmetry, it presents the new ideas coming out of the interactions of string theory and algebraic geometry in a coherent logical context. We hope it will allow students and researchers who are familiar with the language of one of the two fields to gain acquaintance with the language of the other. The book first introduces the notion of Dirichlet brane in the context of topological quantum field theories, and then reviews the basics of string theory. After showing how notions of branes arose in string theory, it turns to an introduction to the algebraic geometry, sheaf theory, and homological algebra needed to define and work with derived categories. 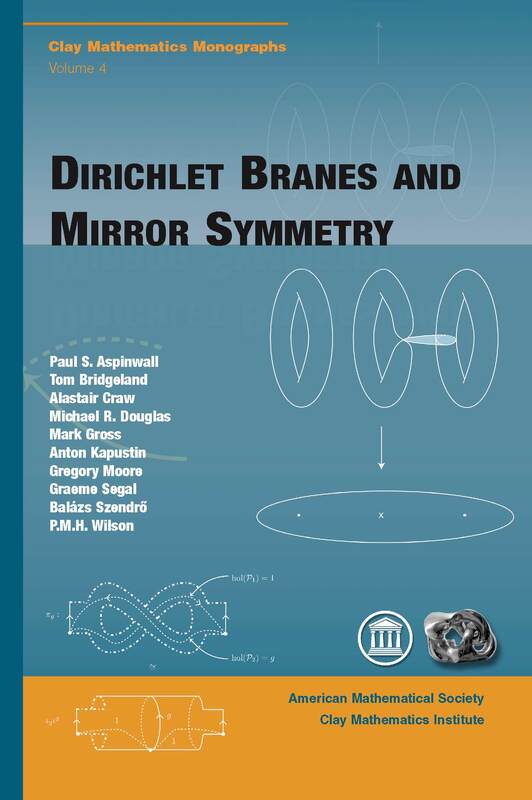 The physical existence conditions for branes are then discussed and compared in the context of mirror symmetry, culminating in Bridgeland's definition of stability structures, and its applications to the McKay correspondence and quantum geometry. The book continues with detailed treatments of the Strominger-Yau-Zaslow conjecture, Calabi-Yau metrics and homological mirror symmetry, and discusses more recent physical developments. This book is suitable for graduate students and researchers with either a physics or mathematics background, who are interested in the interface between string theory and algebraic geometry.